We can fit and build putters in the same way as we have done with irons, drivers and the other heads we custom build at ForeGolf. 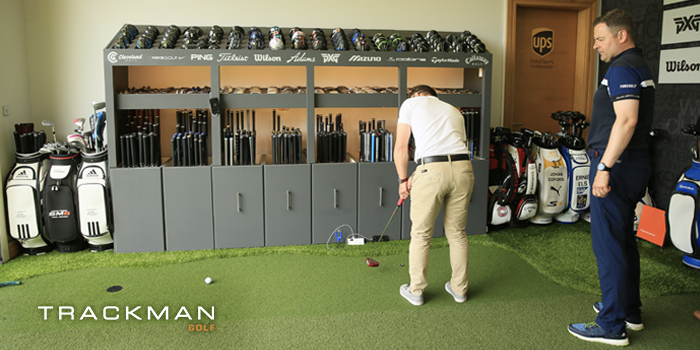 We use TrackMan which has a impressive putting analysis software. We can effectively test the golfers putting stroke for different putter heads, shaft lengths, designs, lofts and face inserts. During our custom fit sessions, we use TrackMan4 for its ball flight analysis data as a way of understanding the needs of the golfer more. The analysis of each golfers unique data allows us to better design the type of club and setup that will best suit that individual golfers style. We have connected our TrackMan wirelessly to an iPhone camera that is mounted at ground level. It shows face on ball positions and also highlights skid patterns and the putter face positions at impact. 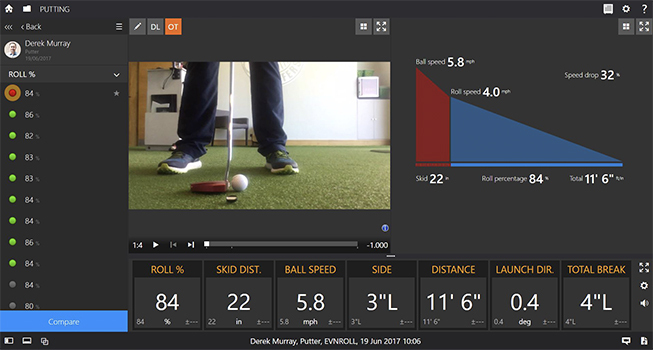 The down the line camera on TrackMan shows club and ball path and helps us to demonstrate how putter head design can dramatically improve alignment, MOI improvement based on path, and how the putts miss the hole. Another excellent feature is the provision of a stimp reading of the green you’re working on, a very handy feature to allow for relative conditions testing. All these different parameters of the ball movement means we can effectively test the golfers putting stroke for different putter heads, shaft lengths, designs, lofts and face inserts. Then build a putter that works best for the golfer and their individual putting style. Once we have analysed all the data from the session, it moves over to the WorkShop where your new perfectly rolling putter will be hand built in 14 working days. We can fit and build putters in the same way as we have done with irons, drivers and the other heads we custom build at ForeGolf. We have to be able to build your putter to an exact measurement, so we can currently only build new custom putters using heads from Odyssey, Taylor Made, PXG and Evnroll. Our range of test putters is largely right handed, please get in touch hello@foregolf.ie if you are left handed, so we can let you know whats possible before you book in. those putts and lowering your scores. You should read what our Customers say about us and their clubs built by ForeGolf.